Shereé Whitfield is taking to her Bravo Blog to dish on this week's episode of The Real Housewives of Atlanta. 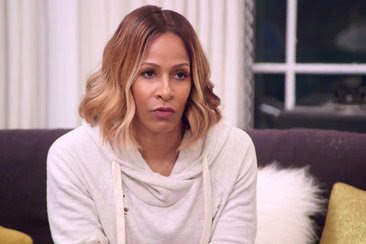 Shereé Whitfield discusses her emotional state following the reveal of the trouble in her relationship. BravoTV.com: What inspired you to get a life coach? How difficult was it opening up to him about Bob? It was also important for me to be able to articulate to my children how abuse affects a person and explain to them that abuse can take shape in many forms when in a relationship. I want my children to know what love is and what it is not as they navigate their own relationships. I want my kids to be able to know the signs when something feels wrong, and I want them to have the emotional intelligence to know that they do not deserve to feel sad, hurt, or less than when in a relationship. My hope is through sharing this part of my life it can help empower others to face their past, learn from it, and heal from it. I want to continue to live in my truth and live my best life. BravoTV.com: What was it like rehearsing your talk with the kids with your friends? SW: Firstly, thank you, Kandi, for opening up your home to me and my friends and providing a safe space to practice this exercise! Rehearsing the talk was definitely challenging because it required me to strip off the armor that I’ve worn for so many years. As a single mom raising my kids, I had to provide and be a source of strength for them. Knowing that this conversation was going to involve me being vulnerable was challenging because it was out of the norm for me as a parent. Rehearsing with my friends was emotionally draining, but I'm so thankful and blessed to have such a strong support system with my family and my friends, who I consider an extension of my family. Michelle, Greg, and KeeKee all gave insight through their honest feedback; because they know my children, they really helped me think about what to consider and expect when framing this message to my kids. SW: I was a bit surprised to hear that Porsha wasn’t going to attend Shamea's wedding only because they have been friends from childhood, and it seemed like it genuinely meant a lot to Shamea for Porsha to be there. SW: It's never a good feeling to see genuine friends having issues. I'm hopeful that they’ll work it out.